everActive - batteries, chargers, rechargeable batteries, flashlights - everActive Ni-MH rechargeables tested by Accredited Testing Laboratory in Sweden! 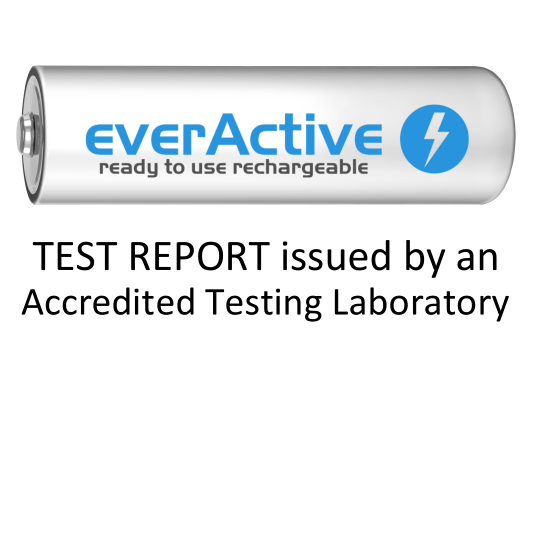 everActive Ni-MH rechargeables tested by Accredited Testing Laboratory in Sweden! After numerous tests of our primary and secondary batteries that can be found on the Internet and press magazines, the time has come for a professional test carried out by the National Certification Body - Intertek Semko AB. Intertek Semko AB, located in Sweden is an elite laboratory capable of testing batteries and other equipment. It is one of only four certified bodies in Europe (as of 18.07.2018, source: IECEE) officially authorized to test Ni-MH batteries in accordance with IEC 61951-2:2017 standard. Intertek Semko AB is the official National Certification Body in Sweden. The tests were carried out on everActive R03 AAA 1050 (1000 mAh rated capacity) and everActive R6 AA 2600 (2500 mAh rated capacity). Results determined by Intertek prove high, actual capacity of our flagship Professional Line rechargeable batteries.